Christian arts festival Greenbelt went from being a hippie gathering on a farm to a key date in any self-respecting music and art-loving person’s diary. Fairnie and Sage were there every step of the way and played a major part in its development, both as a performer and member of the festival council. 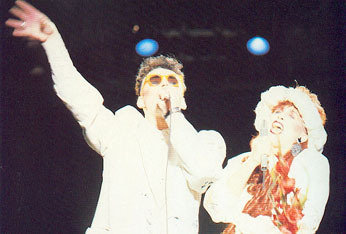 Bev and Steve were mainstage comperes in 1981, produced the fashion show in 1987, and in between time, Fairnie was asked to direct the official video of Greenbelt ’86. Whether trading as Fish Co, Famous Names or Technos, Fairnie and Sage were celebrities whenever the festival took place.